Milestone for Upgrading Two NASA Space Network Ground Terminals Successfully Completed by General Dynamics Mission Systems. A General Dynamics Mission Systems and NASA team have successfully completed a milestone with the installation and initial checkout of equipment needed to upgrade two NASA Space Network ground terminals at NASA's White Sands Complex in New Mexico. Site integration readies the updated ground terminals for 'end-to-end' communications testing scheduled for later this year. The installation, integration and testing are part of the NASA Space Network Ground Segment Sustainment (SGSS) program. The Space Network ground terminals provide command, control, communications and operations management for the Tracking and Data Relay Satellite (TDRS) constellation, the space element of NASA's Space Network. The TDRS constellation is responsible for communicating with more than 40 space-client missions including the International Space Station and Hubble Space Telescope. 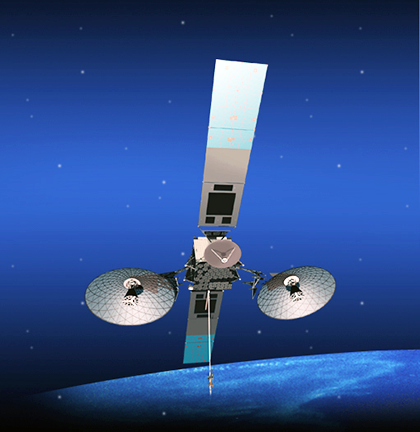 Artistic rendition of NASA's third generation TDRS satellite. The third generation TDRS will be functionally identical to the second generation TDRS, with one major exception — beamforming. Multiple Access beamforming will be performed on the ground, unlike the second generation spacecraft which performs this function on-board. Similar to the first generation, this will allow for the unscheduled S-band DAS to be possible for low data rate use. Manny Mora, VP and GM of General Dynamics Mission Systems, said that the NASA Space Network Ground System is the communications hub for 40 individual space missions currently on orbit, with more missions planned in the future. This is a very large-scale, complex program and together with the firm's NASA team, GDMS is making significant progress without interrupting the legacy Space Network Ground System's day-to-day operations.